Drop-In Classes Monday through Thursday 7:15 pm – 9:15 pm at various locations. See Meditation Classes by Day in right column or below for mobile devices. The General Program (GP) class provides a straightforward presentation of Buddhist view, meditation, and the establishment of a daily practice. This class is suitable for beginners or for those with more experience. In these classes we will learn why we need meditation and discover practical methods to attain peaceful states of mind. In these classes we will study various Buddhist texts written by internationally renowned meditation master and scholar, Venerable Geshe Kelsang Gyatso Rinpoche. Students can purchase books at class or online through the publisher Tharpa Publications. Anyone can learn basic meditation and experience the benefits that come from having a peaceful mind. This class is suitable for everyone, regardless of faith, background or experience. Classes are designed to be self contained and can be enjoyed on a drop in basis. Each class is two hours long and is broken down into several sections. 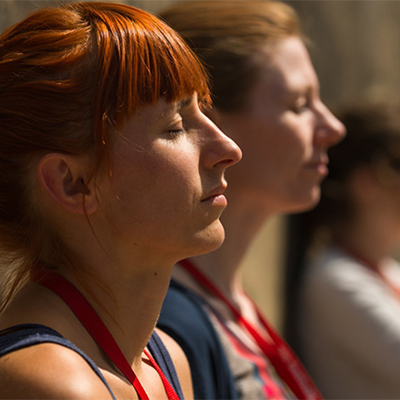 We begin with an introduction on the topic covered then still our minds with a guided 10 minute breathing meditation. This is followed by a 50 minute commentary on the actual meditation practice, then 15 minute guided meditation on the topic that was covered. Then we engage in a 15 minute intra-class discussion and close with 15 minutes for Q & A.